Christian Freed and Dean Cullinane, the duo behind a new, youth-generated, Bible-focused podcast called Why They Did That (WTDT), are in danger of losing their voices, and they’re pretty happy about that. Between live recordings at their booth and Dean’s Bible reading seminar during the Generation of Youth for Christ (GYC) 2018 conference, they’ve done a lot of talking in a short time about the new podcast, one of their favorite topics. Actually, talking and topics are what got them into this ministry. 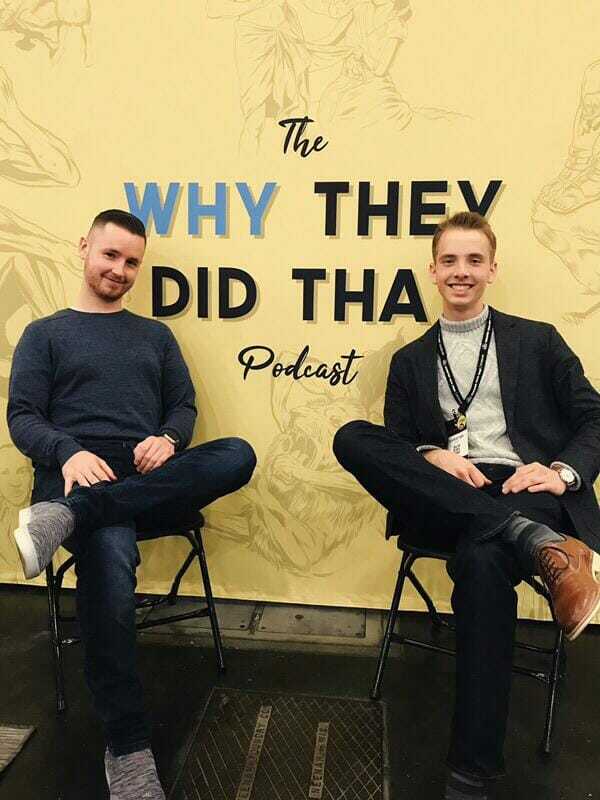 Dean Cullinane and Christian Freed are the producers of Why They Did That, a podcast that helps young people deal with relevant issues through the Bible in a thoughtful, purposeful way. Launched in summer 2018 and publicized at GYC Conference 2018, the podcast’s nine episodes to date have seen more than 25,000 downloads in 80 countries. As a college sophomore, Christian took a Business Communication class, and the professor invited business professionals and entrepreneurs to be guest speakers. As he listened to their innovative projects, an idea of his own started to form. What if he could launch a podcast by young people for young people to have conversations about the Bible and its relevance today for real issues? How did Dean Cullinane, a then-junior theology major, get involved? He and Christian were both students at Weimar Institute, a self-supporting Adventist college in the foothills of the Sierra Nevada in northern California. At first glance, they seemed opposites, since Christian is a single, fifth-generation Adventist who has lived most of his life in California, while Dean is a married, first-generation Adventist from the UK. The two young men found that they enjoyed working together, so with the end of the school year approaching, and after much prayer, Christian shared his dream of a podcast with Dean. Since they had both been involved in creative ministries before, “the initial idea for the podcast gelled fairly quickly,” Christian recalls. They knew they wanted to start by looking at the seemingly simple stories heard in most children’s Sabbath schools and pull out lessons that were deep and relevant for the youth of today. With a wealth of resources in the faculty and staff of Weimar Institute all around them, having a conversation-style show seemed like the logical format. After days of brainstorming with close friends, they came up with the title: Why They Did That. How much work will this take? they pondered. They were full-time students involved in a plethora of other extracurricular activities. However, they decided that no matter what it took, they wanted to be a part of something to meet the crucial need they saw. In the midst of projects, final exams, work, and end-of-the-year programs, Christian met with a campus mentor and determined the podcast could be developed over the summer with the intent of launching in late August, just after classes resumed. The goal was to begin the podcast initially as a college work-study project and involve teachers and students from Weimar. Building on their gifts, they agreed that Dean would be the podcast host, while Christian would manage the production and design. The 20 hours they had anticipated spending on the project each week turned into more than 40 as they researched and experimented over the summer. They quickly realized that they didn’t have all the tools required to make this project a reality but refused to let that hinder them. Turning to a few knowledgeable friends and the examples of many YouTube videos, they trusted that the Lord would make up for their lack. One thing they agreed on is that the Adventist message needed to be packaged in a professional way; engaging conversations would only go so far if the audio quality and production levels weren’t on par with the already established podcasts produced by National Public Radio and the like. It was in recording the first episode with Karl Wilcox, their English professor, that Christian and Dean realized they had something rather special. To build anticipation for the August launch, they connected with social media influencers who already had established their own personal audiences and invited them to be a part of what they were trying to do. As a result, within one week, their three-minute promo had been listened to more than 14,000 times and shared many times over on social media platforms such as Facebook and Instagram. Despite finding out the hard way that each episode was taking twice the amount of time that they had anticipated, Christian and Dean were energized — not merely by what they were learning but also by the people they were connecting with and the potential impact this podcast could have in the lives of young people. “The more we shared the idea with our friends at school, the more excited they got, and a buzz just started to build. By God’s grace, I think after we released the first snippet online, even more people started to see the huge potential of something like this,” Christian stated. On August 31, the first episode of Why They Did That went live, and prayer helped combat any doubts or nerves. At first a few responses trickled in, mostly from friends and family, but then that began to change. After just a few days, the podcasters began receiving powerful testimonies from people all around the world, sharing that they had been touched in a meaningful and profound way. “Wow, I’d never listened to a podcast before, but this is something special. I’d never heard Bible stories shared like this before, and I never knew that it’s this that I always wanted!” one fan shared from Norway. The response continued to grow, and it was astounding. A month after the launch, the pair had listeners in 42 countries with more than 5,000 downloads of the podcast. Those initial numbers have grown to listeners in more than 80 countries with almost 25,000 downloads of the nine episodes to date. A majority of WTDT listeners are in the 18-34-year-old range, which is the marketing world’s ideal demographic. Such success can prove to be a challenge in itself. “One thing I’m constantly having to remind myself is to keep rededicating this project to the Lord. All good things come from Him, and more important than the statistical success of this show is the eternal impact that we’re making,” Christian said. As the podcast gathers more attention, Christian and Dean are fielding inquiries from radio stations to run the podcast, advertising inquiries from businesses and individuals, invitations to speak about creative ministries, and requests to teach other young people how to do this. In fact, their booth at GYC 2018 was often crowded, and so many young people packed into Dean’s seminar that it had to be moved to a bigger room to accommodate them. Christian and Dean feel that it shows WTDT and its concepts definitely fill young people’s need to understand the Bible better. Interestingly, it’s proving to also be a resource for young adults to share with their friends, whether they are believers or not. “The feedback from our listeners is that the podcast helps them start spiritual conversations they might not otherwise have with their friends, classmates and coworkers,” Dean said. One listener thanked them after the first episode because listening helped her in a tough conversation with someone. She was able to share what she had heard, and the door opened to future conversations about God. What started out as an idea and then a project became a passion over a summer. In 2019, the podcast is a definite ministry they both plan to stay involved with for the long haul. Christian admitted, “We don’t know where this is going to go, but we know that God is leading. That’s exciting. That’s all we need to know really. Our prayer is that we would only be faithful to the little work that God has given us to do, and that above all, His name would be glorified!” After all, this is the real reason Why They Did That. The Why They Did That podcast is available on iTunes, Spotify, and wherever podcasts are found.